Also - there's an app called "Media Monkey" - that's excellent for sorting music and re-organizing the file system using MP3 tags. I have no relationship with the company, it just saved me SO much time, I would recommend it, lol. 100% Agreed on Media Monkey. It's the best music/video management app I've seen. I keep mine sorted by Genre/Artist/Album, but only have a 32GB card so I don't have my full collection on it. My total songs is in the 3k mark, but the folders are only in the 600-900 range. Another vote for Media Monkey! Have all my music sorted through that program and it all works great, imo. Artist/Album/Song. Almost 6k songs in my Dart on a 32gb SD card, no problems what-so-ever. Over 15k songs on my computer. Love Media Monkey. Yep, I do think it was the folders, it's reading all 53 GB! First SDXC (Fat32) don't work in my 2011 Journey, only SDHC (Fat32), so I'm limited to 32gb cards. I decide to use a 128gb (Fat32) USB stick and it work great. The first try, my system recognize only 5999 songs. As you can read on this thread, Uconnect is enable to read only 1024 folders, and my song are organized by Artist/Album/Songs. I need to eliminate some folders and organize my usb stick only by Artist/Songs. After that, I can see all my 8000 songs. This application can synchronize all songs, and playlist on your USB stick / SD Card. With this application you can export songs by creating only artist or album folder if you want, so this is reduce the number of folders. Unfortunately my 2011 Uconnect (Updated in 2015) don't allow me to see Artwork, even if all artworks are embedded in each song. That would likely require a software upgrade, and I wouldn't hold my breath for it. Just like the fake Pandora integration. I keep hoping for an update to make it actual integration, and not just a remote player pause-skip option. I know it's old, but any luck with this? There's a 4GB SDHC module in the radio, but it doesn't have a normal SD card interface. A few weeks ago, I hacked into one of my RE2 radios by pulling the module out and soldering the test points to a Micro SD to USB adapter and could read and write to it. 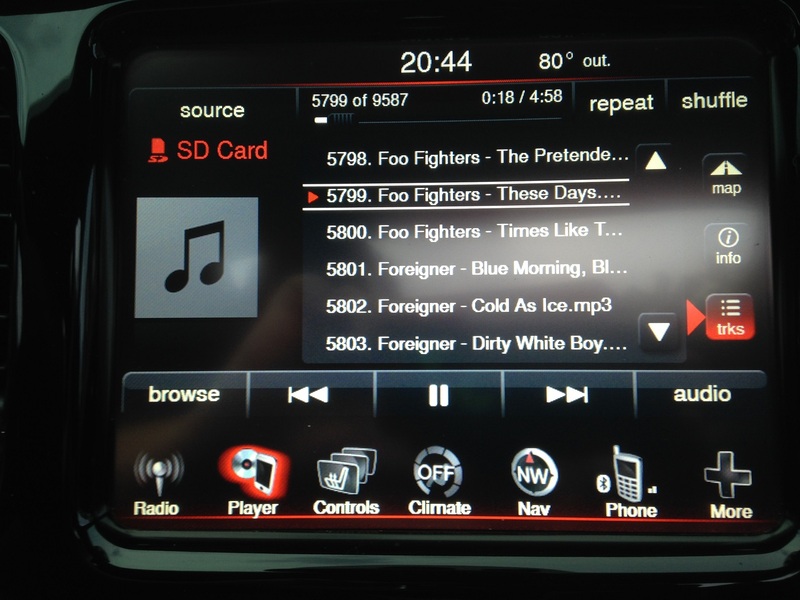 The Gracenote database is"
Messy, until we get a real update from Chrysler. 3) Solder SD module test points to a SD to USB adapter and copy database to a computer. 4) Desolder SD module and reassemble new radio. 5) Repeat steps 1-3 on the older radio, but copying the newer database to the older SD module. 6) Desolder SD module and reassemble old radio. Last edited by Shotgun1125; 07-13-2016 at 09:01 AM. have to check this out thanks for the info. Anyone able to help me out. When I use the usb cable for my iphone 6s it will keep skipping song after song. Even if i select repeat song on my phone. How can I fix this?